In need of the best Oneplus one ROM for Android Oreo, Nougat, and Marshmallow? Then you'll find a list of these outlined in this post which you can easily install via recovery mode on Android. What makes each we've selected the best ROM for Oneplus one in 2018 is characterized by its ability to provide stable operation and the most important features. The OnePlus One as the 2014 flagship killer device from the start-up company, OnePlus is still an admirable device despite its year of release. Its Qualcomm Snapdragon 801 processor, CyanogenMod OS, humongous 3GB RAM storage, 3100mAh large battery capacity, 13MP and 5MP high-resolution cameras and much more are some of the reasons why it is still popular among mobile enthusiasts around the world. But when it comes to its stock ROM, can it be updated to enhance the level of user experience? Definitely! You can customize the ROM of the Oneplus one. Several Custom ROMs are available for the Marshmallow, Nougat, and Oreo versions of the Android OS, but as usual, the problem lies with finding the best out there which is no longer an issue thanks to the list of CustomROMs for One Plus 1 we have outlined below. A custom ROM is an operating system that can be installed by a user in a bid to enhance the capabilities of their device and remove certain limitations defined by the manufacturer of the device. It is a standalone OS designed by Android developers in forums such as XDA forum and it is used to replace the Stock Android OS. The result is the ability to tweak the phone, remove apps pre-installed by the OEM, and get certain features which wouldn't have been possible while the stock ROM was installed. Now, this also makes up part of the reason why people change the Stock firmware of their smartphone to a custom ROM. The difference between a Stock ROM and a Custom ROM is that a stock ROM comes preinstalled on any new device while the latter is a customized one installed at a later time by the user. The best Oneplus one ROM 2018 for your rooted smartphone is one that will enhance your Android experience by giving a high level of performance while at the same time ensuring efficient battery power management. 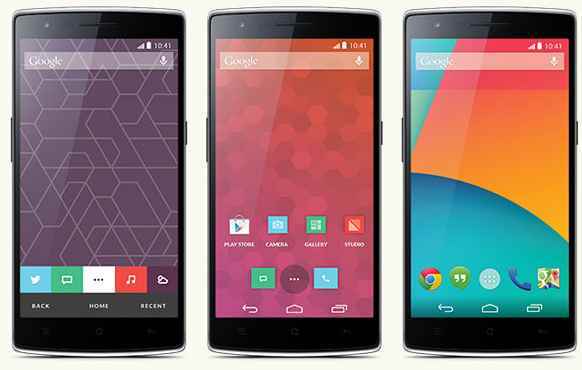 LineageOS Oneplus one ROM, an upgrade to CyanogenMod is one of the most popular custom ROMs. Developed by Jgcaap of XDA forum, it has a stock ROM UI skin and it's suitable for the Android 8.0 Oreo while its ROM kernel is that of Linux 3.x. The LineageOS 15.1 as the latest version of this OS comes with unique changes such as a New kernel, F2FS ready for data and cache, and latest webp. Android Ice Cold Project (AICP) version 12.1 is the latest version of this OS. It is based on Lineage and its ROM kernel is Linux 3.10.x. This Custom ROM optimization feature supports the Android version 7.1. It is recommended that you wipe your device fully before flashing it, and not to restore the system apps and data with Titanium Backup since it may cause stability problems. CarbonROM 6.1 for bacon, is a stable ROM for OnePlus One that supports Android 8.x Oreo and its ROM kernel is Linux 3.4.x. It is based on AOSP (Android Open Source Project) and as such, it is an unmodified ROM that may be similar to the Stock ROM on the Pixel phones. This is an aftermarket firmware that is fast, stable, and loaded with several features. AOSP Extended prides on the fact that it is a ROM by a user for a user. This AOSP based ROM is similar to the original AOSP, but it still enhances your level of experience since it comes with several customization features and offers seamless operation on your Oneplus One device. The AOSP Extended ROM V5.7 is the latest version and it can provide the important features you require from your smartphone. Bootleggers ROM is based on GZOSP (Ground Zero Open Source Project) with support for Android 8.1 Oreo. The features of this custom ROM an enhance the design of your phone thanks to its themes and wallpapers, and its ringtones and fonts are other features you can look forward to. These are the best Oneplus one ROMs on XDA for Oreo, Nougat, and Marshmallow that can help you remove the limited functionality of your smartphone. Although installing TWRP Recovery on your device will help you install these ROMs, the precise steps on how to install these Custom ROMs on Android has been outlined in the XDA pages whose links have been placed in this post. For the best results, where your OnePlus One device performs seamlessly after installation, ensure that you follow the steps that have been outlined.